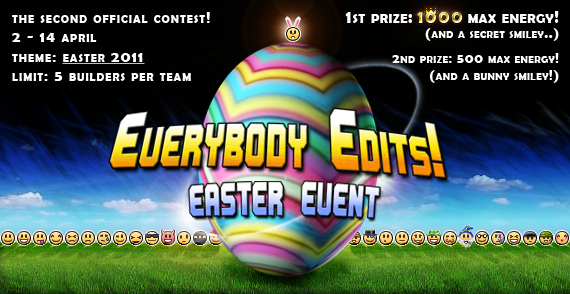 » Everybody Edits Easter 2011: Sign your teams up here! Everybody Edits Easter 2011: Sign your teams up here! DO NOT POST YOUR LEVELS HERE! There will be a separate topic made within a few days where you can post your levels. So start posting your teams and good luck with the contest! NOTE: Some people asked if it's alright to build your level before 7 april, and the answer is yes. You can start building right away if you want to. 48. Unbox't: Chimi, EEGuy, JadElClemens, TakoMan02, shift. 165. Runouw's Team: Blackboy1323, YoshiMario96(Yoshipizza9), Hottie09 ,Luigifan64, Hybrog. E Team: Smaland47, A01A01, 3mike231, micahman5, peppyk. Re: Everybody Edits Easter 2011: Sign your teams up here! Members: Yoshii, KRAZYMAN50, Slayer, Modern, Theed56. I do not have confirmation of some members!